The venerable, renowned rink is where the Flames called home when the franchise moved to Calgary from Atlanta and the old building sits across the street from where Jankowski and the Flames now play their home games at the Scotiabank Saddledome. The Stampede Corral also was a rink Jankowski’s late grandfather, Lou, enjoyed five fantastic seasons of minor-pro success for the Calgary Stampeders of the old Western Hockey League in the late 1950s and early 1960s. Jankowski’s grandfather was a high-scoring forward who spent three of his 18-season pro career with the Detroit Red Wings and Chicago Blackhawks. In Detroit, he played with Gordie Howe, Ted Lindsay and Alex Delvecchio, who also was his junior teammate with the Oshawa Generals. Lou performed with Bill Gadsby, Bill Mosienko and Gus Mortson in Chicago. A head injury, in which he spent three months in the hospital, cut short Lou’s stay in the NHL. But he persevered and enjoyed his best seasons in Calgary, then an affiliate of the Blackhawks. The older Jankowski scored a whopping 57 goals in 69 games to win the 1960-61 Leader Cup as league MVP and twice lost in the league final with the Stampeders. 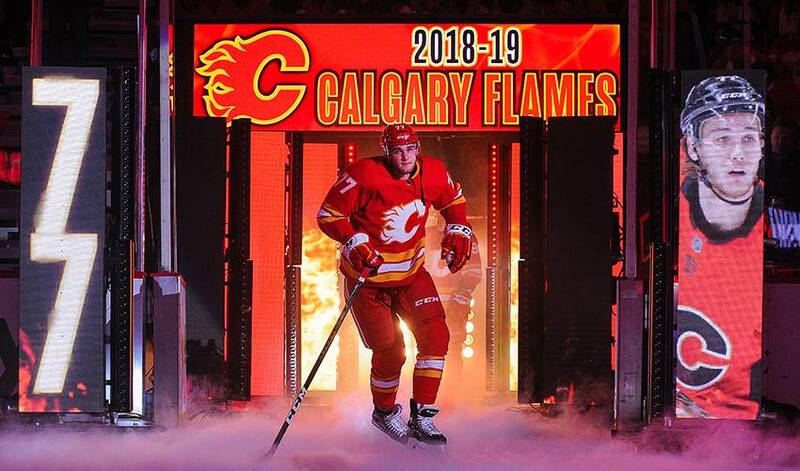 “I was excited to be drafted by Calgary with the family connection,” said the 24-year-old Jankowski, selected in the first round (21st overall) of the 2012 draft. “I knew [grandpa] had played here. The local hockey fans also remembered Lou Jankowski, who passed away in 2010. Last year, a fan dropped by two old sticks — one autographed by Lou — that Jankowski’s grandfather had played with more than 50 years ago. “That was so cool,” 24-year-old Mark Jankowski said. After his playing days, Lou was a long-time scout for the New York Rangers. It was always special when Lou would make his way east and dropped by to watch Mark play in his AAA minor games. His grandfather is not the only connection Jankowski has to a deep hockey past. His Dad, Len, played at Cornell University and earned an engineering degree. His uncle, Ryan, is the Buffalo Sabres director of amateur scouting. Grandfather Lou's wife was the sister of Hockey Hall of Famer Red Kelly, a teammate with the Red Wings who would go on to win four Stanley Cups with Detroit and four more with the Toronto Maple Leafs. And another part of Jankowski’s great hockey lineage. “I guess you could say I was born into the game of hockey,” Mark concluded.